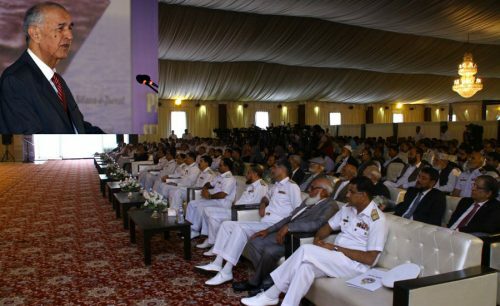 KARACHI (92 News) – Pakistan Navy celebrated 47th HANGOR Day today to commemorate the courage and valour of the force that sank Indian Navy Ship KHUKRI in 1971 war. 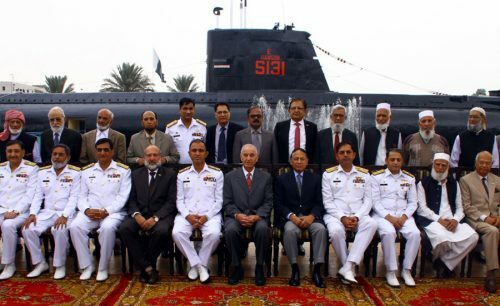 In this regard a simple yet elegant ceremony was held by 5th Submarine Squadron at Maritime Museum in Karachi where ex-PNS/M HANGOR is displayed. Vice Admiral (Retd) Abaid Ullah Khan was Chief Guest on the occasion. Addressing the ceremony, he said Submarine HANGOR remained a pride for Pakistan Navy in 1971 war and its gallant action was a spectacular tactical battle resulting in sinking of Indian Navy’s Frigate. He said the sinking of KHUKRI crippled Indian Navy’s morale and its nefarious designs of subsequent attacks on Karachi. Vice Admiral (Retd) Abaid Ullah also paid rich tribute to heroic action of PNS/M GHAZI which was deployed off Vishakhapatnam due to which Indian Navy moved its Navy Ship VIKRANT further eastward to Andaman Island which made the ship ineffective throughout the war. In recognition of their courage, the valiant crew of HANGOR was decorated with four Sitara-e-Jurrats, six Tamgha-e-Jurrats and fourteen lmtiazi Asnaad. This is the highest number of operational gallantry awards given to a single unit of Pakistan Navy. The ceremony was attended by Submarine HANGOR’s veterans and a large number of senior serving and retired naval officers. The guests were also invited to visit ex-PNS/M HANGOR to revive their golden memories.